Included below are homes for sale in Mission Beach. If you would like more information on any of these Mission Beach real estate listings, just click the "Request More Information" button when viewing the details of that property. We can provide you with disclosures, past sales history, dates and prices of homes recently sold nearby, and more. And, if you haven't already, be sure to register for a free account so that you can receive email alerts whenever new Mission Beach houses come on the market. 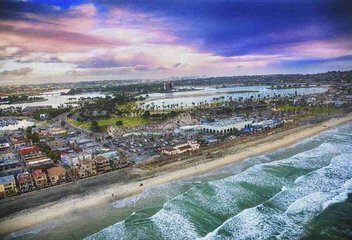 The community of Mission Beach is nestled on a sandbar between Pacific Beach and Mission Bay. The San Diego River estuary defines its southern boundary, where the fresh river water spills into the bay. Its geographic location lends itself to sandy soil, making it difficult to build commercial and residential developments. As a result, Mission Beach’s oldest structures date back to the 1920s. Early builders had a difficult time building stable homes on Mission Beach’s sandy land, so many projects were shelved until better building techniques had been established. In a successful attempt to bolster the Mission Beach housing market, small land lots primed for development were sold for a very low price in 1914. As a result, the homes in this area are packed close together, making it one of the densest housing developments in San Diego. A main thoroughfare, Mission Boulevard, which divides the community into North Mission and South Mission, bisects Mission Beach. The southern end of the community is home to a jetty that extends into the ocean, making it a popular place to visit on a sunny afternoon. Mission Beach, and the nearby Pacific Beach, is filled with fun things to see and do. As their names would imply, their white sandy beaches cover almost 4 miles. This is the perfect spot to enjoy the beautiful weather and take a walk, swim, or sun bathe. These beaches are covered with seashells and sand dollars during low tide, so if you like to collect those kinds of things, the beaches are vacation spots that you will not want to miss. Belmont Park is the typical tourist beach, but it is popular with locals as well and is definitely worth a visit. One of Belmont Park’s claims to fame is its wooden roller coaster - The Giant Dipper - that is the 2nd oldest of its kind in the United States. Belmont Park also includes a popular merry go round, a simulated surf ride, and an arcade. The food options are varied and include everything from sit down restaurants to smaller stands where you can grab a quick bite to eat. The boardwalk area overlooks the ocean and is home to a diverse selection of shops that sell everything from surfboards to clothing. There is even a spot to rent bikes, surfboards, and boogie boards for the day. Renting a bike can be a great way to explore Mission Beach. Some of the best oceanfront bars and restaurants are most easily reached by bike. This list includes Lahaina’s Beach House Bar and Grill, an establishment that is consistently ranked as one of San Diego’s best spots to eat and drink on the beach. Its outdoor patio lets patrons enjoy a cool sea breeze while enjoying food from a diverse menu and drinks from a fully stocked bar. If spending time on the water is your thing, don’t miss the Bahia Belle - a paddleboat that takes nighttime cruises along Mission Beach and Pacific Beach. The beautiful surroundings meld with the live music to provide a relaxing evening with friends or a starlit night of romance. The real estate in Mission Beach includes a selection of single-family homes, condos, and townhouses. The condos tend to sell for around $1 million while the single-family homes average close to $3 million. The prices in this affluent area are as can be expected from a beachfront community, with waterfront homes selling at a premium. Due to the relatively small size of the lots in Mission Beach, the majority of its early homes have been redeveloped to become two story dwellings. In many cases, this doubled the usable number of square feet, making the homes in Mission Beach the perfect size for a growing family. 2990 Mission Blvd is a small condominium complex that was built in 1975. The condos are single story with one to two bedrooms, two private balconies, and a garage. The condos have views of the adjacent park and ocean. 4 on Ostend is a three story luxury modern coastal townhome complex that was built in 2016. The townhomes were designed by Tim Golba and have two to three bedrooms, private decks on all levels, a rooftop deck for viewing ocean and bay views, and an attached tandem garage. 711 Island Condos is a condominium complex that was built in 1974. The condos are two stories with two bedrooms, fireplace, private balcony for viewing the ocean, and a garage. Asbury Court is a small 5 unit three story townhome complex that was completed in 2005. The townhomes are three stories with three bedrooms, a tandem parking garage, and rooftop deck. Bay View Villas is a small gated condominium complex located at 3745 Mission Boulevard and was completely renovated in 2006. The condos have two to three bedrooms, a private entrance, private balcony, storage, and plenty of parking options. Bonita Grande Condos is a small condominium complex with about 5 units and was built in 1966. The condos are three stories with an attached garage on the first floor, two bedrooms. Community amenities include barbecues and laundry facilities. Carmel Villas is a 4 unit bayfront condominium complex located on Bayside Lane. The condos are two stories with two to three bedrooms, a private balcony showcasing indoor/outdoor living a views of the bay, and a rooftop deck. The complex has an underground garage. Casa Bahia is a 6 unit condominium complex located at 2808 Bayside Walk and was built in 1972. The condos are two stories with three to five bedrooms and a private balcony for viewing the adjacent Bay. The penthouse units have rooftop decks. Ensenada Court Villas is a small 4 unit townhome complex located at 808 Ensenada and were built in 2007. The townhomes are three stories with three bedrooms, a private front patio yard, private balcony, deck, and an attached garage. Ensenada De Sur is a condominium complex that was built in 1989. The condos have two bedrooms, two fireplaces, a tandem garage, patio, and rooftop area showcasing nearby bay and park views. Fijian is an 8 unit bayfront condominium complex located at 2820 Bayside Walk and was built in the 1970s. The condos are single story with two to three bedrooms, private balconies with bay views, fireplace, and garage. Residents can access the beach from the complex. Franklin Shores is a two story 16 unit bayfront townhome complex located at 3750 Bayside Walk and was built in 1973. The townhomes have two bedrooms, large patios, two balconies, and a garage. Jamaica Condos is a 10 unit oceanfront condominium complex located at 3275 Ocean Front Walk and was completed in 2006. The condos are single story and range from studios to two bedrooms. The penthouse unit has its own private rooftop deck, private ground floor patio area, and a large indoor/outdoor living space on the second floor. Jersey Court Condos is a 4 unit condominium complex that was built in 2009. The condos are two stories with three bedrooms, private balconies, patio, and attached garage. Las Palmas is a 3 unit bayfront condominium complex that was built in 2008. The condos have four bedrooms, a fireplace, private bayfront deck off the living room, elevator, and attached garage. Manhattan Lofts is a three story townhome complex that was built in 2010. The townhomes have two to three bedrooms, private balconies, patio, rooftop deck to enjoy ocean views, and a garage. MB Oceanfront is a small luxury oceanfront condominium complex located on Ocean Front Walk. The condos are single story with three bedrooms, a tandem garage, ocean view patio, and fire-table lounge. Mission Beach Towers is an 18 unit condominium complex located at 2965 Mission Boulevard and was built in 1970. The condos are single story with two bedrooms and a private balcony. Mission Point View is a two story 14 unit ocean view and gated condominium complex located at 2613 Mission Bouelvard and was built in 1972. The condos are single story with one bedroom and a private balcony. Community amenities include a spa, barbecues, bike storage, and community courtyard. Mission Shores is a 6 unit bayfront gated condominium complex that was built in the 1970s. The condos are single story and have one to four bedrooms, entry patio, and balcony showcasing by a views. Mission View Point is a 14 unit bayfront gated condominium complex located at 2613 Mission Boulevard and was completed in 1972. The condos are single story with one bedroom and balcony. Community amenities include a spa, sauna, bike storage, laundry facilities, and barbecues. Ocean Blue is a small condominium complex on Mission Bay on Ocean Front Walk. The condos have views of the ocean and jetty, are single level with two to three bedrooms, and have a private patio area. There are is a tandem garage as well. Ocean Front One is a small 4 unit oceanfront condominium complex located on Ocean Front Walk and was built in 1986. The condos are single story with one to three bedrooms and a private balcony. Ocean Front Villas is a 4 unit oceanfront condominium complex located on Ocean Front Walk and was built in 1985. The condos are single story with two bedrooms, a private balcony patio, and attached garage. Ocean Vail is a 6 unit ocean front condominium complex on Ocean Front Walk that was completed in 1985. The condos are single story with two to four bedrooms, fireplace, private balconies with direct ocean views, and tandem garage with an elevator. Ocean West is a 7 unit oceanfront condominium complex on Ocean Front Walk and was completed in 1974. The condos are two stories with two to three bedrooms, fireplace, private balcony with unobstructed ocean views, and a garage. Oceana Gardens is an oceanfront twinhome complex with only two units and is located on Ocean Front Walk. The twinhome were built in 1986 and are two stories with three bedrooms. There are two private balconies, rooftop deck, fireplace, and garage. Pacific Sands is a luxury oceanfront condominium complex located on Ocean Front Walk and was built in 1999. The condos are single story with three bedrooms, oceanfront balcony, and a garage. RCMB is a 10 unit luxury oceanfront condominium complex located at 3607 Ocean Front Walk and was built in 2007 with an underground parking garage. Rockaway is a 3 unit luxury oceanfront condominium complex located at 3785 Ocean Front Walk and was built in 2007. The condos are two stories with one to two bedrooms and a private patio overlooking the ocean. San Gabriel Villas is a two unit townhome complex located on San Gabriel and was built in 1984. The townhomes are two stories with three bedrooms, two patios overlooking the bay, fireplace, and a garage. Sandcastle is a condominium community located adjacent to the Mission Beach boardwalk and is under a land lease until 2037. The homes have three bedrooms, a private balcony, and a garage. There are ocean and park views from the condos. South Beach is a 5 unit oceanfront condominium complex at 2999 Ocean Front Walk and was built in 2006. The condos are single story with two to three bedrooms and a private balcony where residents can enjoy panoramic views of the ocean. There is an attached garage in the complex. Surf Rider is an 11 unit oceanfront condominium complex located on Ocean Front Walk and was built in 2000. The condos are single story with two bedrooms and a private balcony where residents can enjoy panoramic views of the ocean. Community amenities include a large patio, spa, barbecues, and a fitness room. Top of the Beach is an oceanfront condominium complex located on Ocean Front Walk and was built in 1974. The condos are single story with two bedrooms and a private balcony or patio overlooking the ocean.